A College of Medicine professor designed this ultimate facility so students can learn with state-of-the-art technology. Professor Andrew Payer will never forget the 25-year-old patient who entered his office days before a stage 4 brain cancer surgery that could buy the man time — or kill him. The patient said that if things didn’t work out, he wanted to donate his body to Payer’s medical school lab in Galveston, Texas. 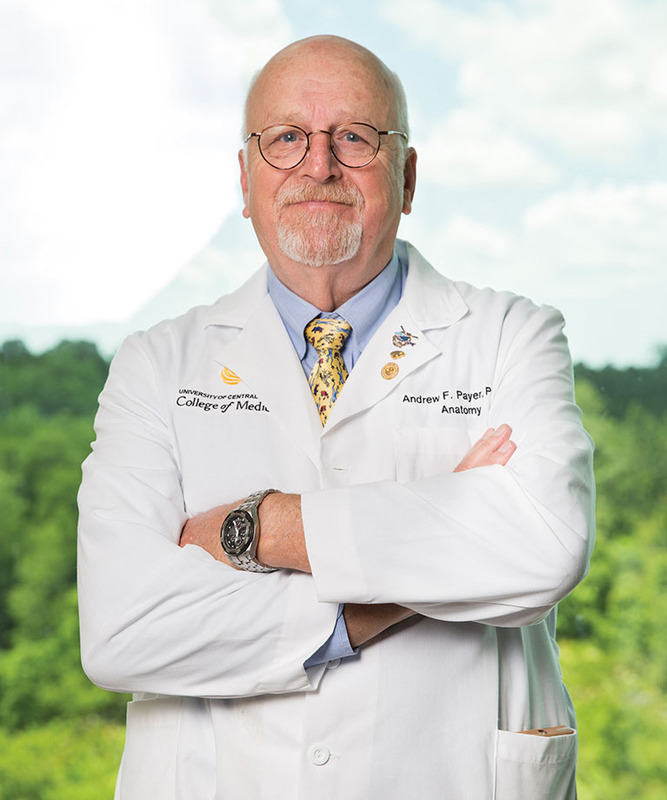 Andrew Payer, professor of anatomy at the UCF College of Medicine. The man died on the operating room table. Months later, when a new class of medical students saw his cadaver and remarked on his youth, Payer told them about saying goodbye to the man and relayed his message. Now a professor of anatomy at the College of Medicine, Payer runs the state-of-the-art Anatomy Lab, where he continues to tell this story to convey to his students the importance of the donation that their “first patients” have made. Because to Payer, the Anatomy Lab experience is more than an exercise in cataloging organs and body structures — it’s about understanding life, death and humanity. 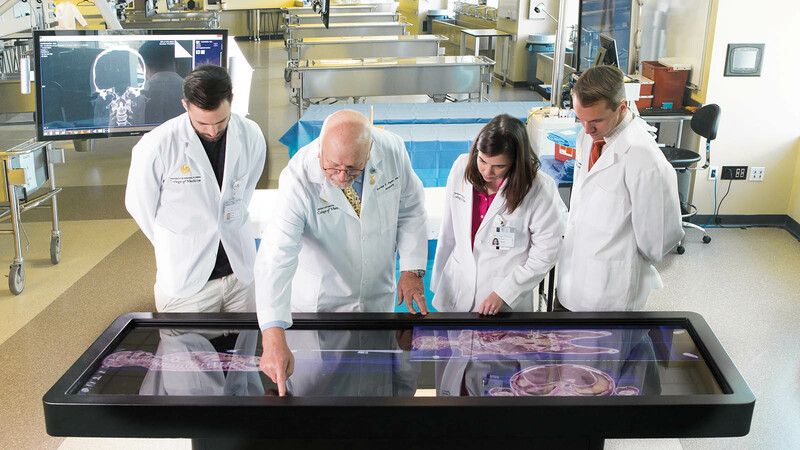 Payer has taught anatomy for almost 40 years and describes UCF’s innovative facility as the lab of his dreams, where technology complements an integrated curriculum incorporating basic and clinical sciences. Memorizing body parts won’t make students good physicians, Payer says. Instead, students need to understand the clinical impact of disease and aging so they can care better for their patients. The latest innovation is the Anatomage Table, which allows students to virtually isolate and visually dissect countless 3-D layers of a digital body. Push a button, and you see every bone in the skeletal system or the web of nerves leading to the brain. Make a digital cut with your finger, and you see a cross section of a patient’s liver. Scan your patient’s head, and see images of every muscle, nerve and artery around the eye. Using an interactive display, students can quiz themselves. The table also allows students to use digital instruments like needles and probes to see how they actually pass through tissues and muscle. Such innovation helps fourth-year students visualize how they will do surgery before they ever enter an operating room. The lab’s 80-inch, high-definition, touch-screen monitor allows faculty and students to compare giant anatomical images in stunning detail. Students can compare a textbook drawing of a heart with a CT scan of their cadaver’s heart, allowing them to understand the human body’s individuality. Detailed images also show how muscles, arteries and organ systems connect and interact, allowing students to work together to solve anatomical issues. Team learning is a key part of the medical school’s curriculum, helping students understand that health care is most successful when people work together. Apple AirPlay technology allows Payer to capture images of unique pathologies with his iPad and project them to every computer screen in the room. Each of the 20 dissection tables has a high-definition screen overhead, and screens also line the lab’s walls. Students don’t have to crowd around one dissection table struggling to see — they look up from their stations and get a detailed lesson. A recent “first patient” had lung cancer that had spread. Thanks to technology, all 120 students saw the cancer and how its metastasis had infiltrated the body. Every year, Central Florida radiologist Dr. Rick Ramnath and his partners at NeuroSkeletal Imaging take full-body CT scans of every cadaver donated to the College of Medicine. The donation gives students experience in medical imaging and a detailed look at clogged arteries, artificial hips and cancerous tumors before they start dissecting. Scans can be viewed on the computer screens at each anatomy table to increase learning opportunities. Ramnath’s donation is inspired by Dr. Deborah German, dean of UCF’s medical school. German was the associate dean for students at Vanderbilt University School of Medicine when Ramnath was a student, and he says she made sure students got the most out of medical school. “When I heard [Dr. German] was coming to be dean of Orlando’s new medical school, I had to reach out and do my part to help,” he says.